Even though Android’s task switching feature has been rather mundane up until Honeycomb, it has served its purpose very well. By longpressing the Home button, we’ve been able to switch between recent apps – and for 9 out of 10 users this will probably suffice. But if you want to expand and customize the app switching experience on Android, there are a number of utilities that take advantage of the platform’s excellent multitasking capabilities. 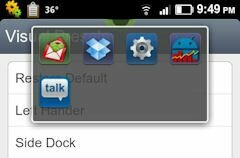 One of my favorite task switching solutions is probably the list of recently used apps in the notification bar that HTC’s latest devices feature. 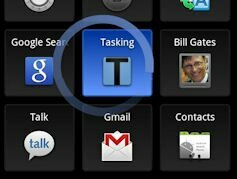 It’s for obvious reasons not available in the Market, but here are three excellent task switchers for Android that are just a few mouse clicks away. Clutch Pad is my favorite task switcher for Android, simply because it’s so convenient to use. It shows a transparent button on the screen regardless of which app you’re currently using, and when you tap this icon, Clutch brings up a list of recent applications that works just like Android’s native task switcher. You get to choose where to place the icon, and I personally feel that the top center of the screen is the optimal position. Clutch supports various swipe actions and the app is highly customizable. I happen to know that Steve Albright will add root level features to Clutch any day now, such as support for simulating presses on hardware keys. If you have a rooted Android phone, you’ll be able to just swipe right on the Clutch button instead of reaching down for your Back key – very convenient. Clutch is $1.99 in the Market. This is one of Android’s most popular application launchers, and it lets you bring up a grid of app shortcuts by swiping a region of your screen. For example, if you press the lower-right corner of your screen and then slide your finger towards the center, SwipePad will show a list of the apps of your choice. This process allows you to run SwipePad from any application without showing a button on the screen that may be aesthetically displeasing. However, a drawback with this particular app is that it can be a bit difficult to bring up, since other actions usually are associated with pressing the screen. It gets easier and easier the more you use it, though. SwipePad isn’t a task switcher per se, since you have to add shortcuts to it manually, but it serves the same purpose. It’s is available for free in the Market. Just like Clutch Pad, this app shows a subtle icon on the screen at all times. When you tap on it, Smart Taskbar lets you launch any app, switch between recent tasks, and more. The reason I prefer Clutch Pad is that Smart Taskbar’s interface is rather cluttered and it would definitely benefit from being more streamlined. 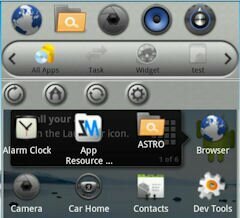 On the other hand, Smart Taskbar is free. It has an average rating of 4.4 in the Market based on nearly 1000 reviews, so people obviously enjoy this app. Do you know of any more quality task switchers for Android?